You may be thinking about the best (most humane) way to interact with these amazing creatures. We certainly did. And we hope our post helps you in your search. Let’s start off with the red flags. A huge no-no is elephant riding. It’s a tempting activity as it looks like a lot of fun, but it’s cruel to the animals. Elephants may seem like they can hold a lot of weight on their backs but the truth is that their spines aren’t made to carry the weight…especially for several hours a day. The process of training elephants for riding is cruel. They remove them from their mothers at a young age and beat them using hooks and whips to control them throughout their lives. Elephants are matriarchal pack animals, which means that removing them from their families causes them a lot of distress. This can lead to psychological problems for them later in life. And now that the sad part is over (phew! 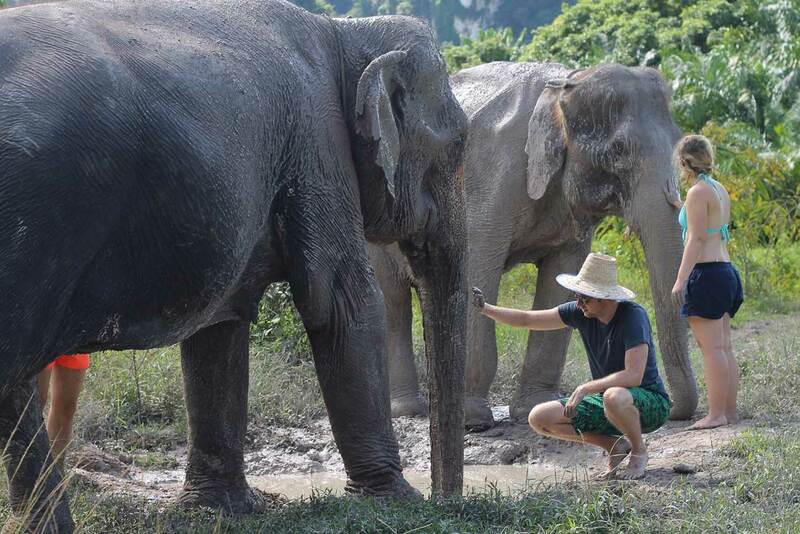 ), let’s talk about our experience at Krabi Elephant Sanctuary. We spent a morning, 8am-12pm, with two retired working elephants. This has been one of our favorite things to do in Thailand. This is a new sanctuary and they’ve acquired three elephants. Unfortunately, one had diarrhea when we visited so we interacted with just two. We’ve since read reviews that involve all three of them so it appears all our healthy now, which is great! These elephants are older and come from intense working environments. Spending time with elephants was number one on our list of things to do in Thailand, but we wanted to be sure it was done right. 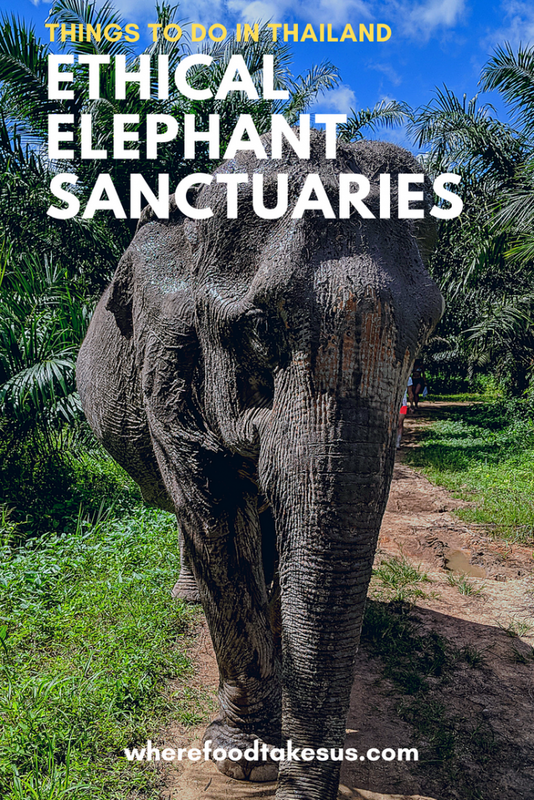 We approached this sanctuary with a lot of skepticism because the term “sanctuary” is known to be used as a cover up to attract ethical-conscious tourists. After loads of research, we decided to go with this sanctuary because the reviews made it seem like a safe and happy home for the elephants. This sanctuary also stood out a more ethical than the other neighboring elephant sanctuaries in Krabi. 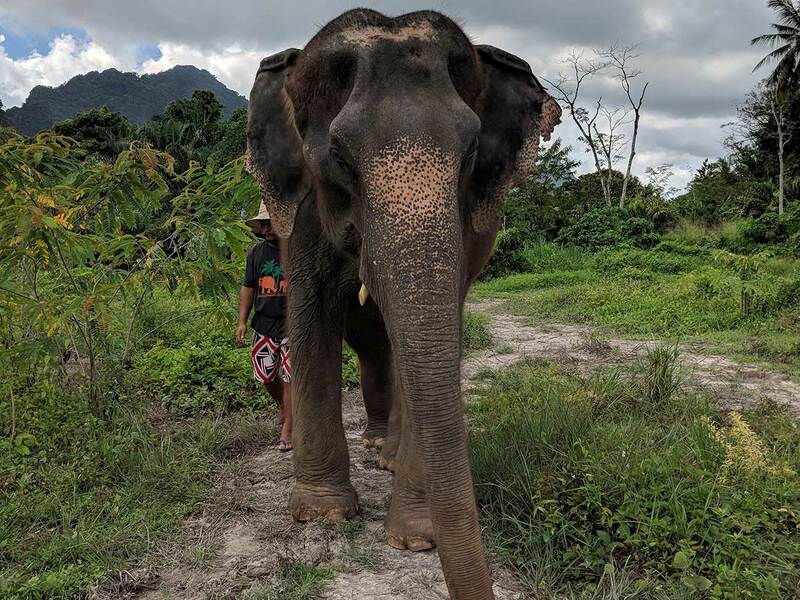 We were taxied from our Airbnb to a location about an hour outside of Ao Nang, where we were greeted by the two elephants, happily swinging their tails. Our time with them began by feeding them bananas. A LOT of bananas. We also fed them a vitamin-rich meal that we got to prepare by hand, as well as some sugar cane leaves. We then went on a walk through the property, which is quite large and beautiful. After about 10 minutes we ended up at a mud pit in which we bathed with the elephants. This was a fun experience and it was obvious that the elephants loved spraying mud all over themselves. Afterward, we then walked to a small lagoon where we bathed them and washed the mud off. This part was really fun, but it doesn’t make a ton of sense for the elephants because the purpose of covering themselves in mud is to protect them from the sun. However, another group arrives in the afternoon so we guess it makes sense from the business’ perspective to have cleaner elephants. All in all, the elephants really seemed to enjoy the activities, especially eating time and mud baths. Their tails were wagging almost the entire time and their eyes relaxed and closed, which signals that they’re content. We noticed a little swaying from side to side at times, which is a sign of distress, but that could be a factor from not being in a huge pack, past trauma, etc…. 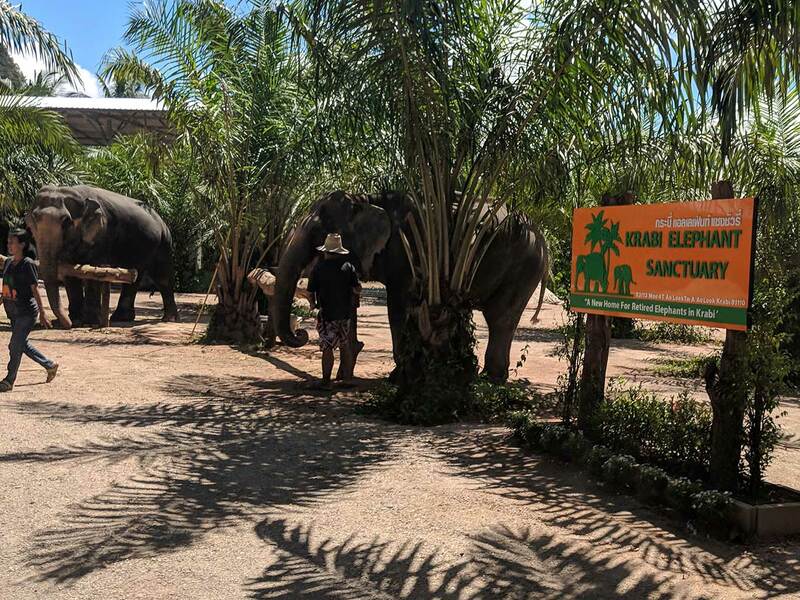 Krabi Elephant Sanctuary is a new establishment and it truly seems like it has good intentions, ultimately providing the elephants with a better home. There’s some room for improvement, but after reading some terrible reviews about other sanctuaries, we think this place is on the right path! 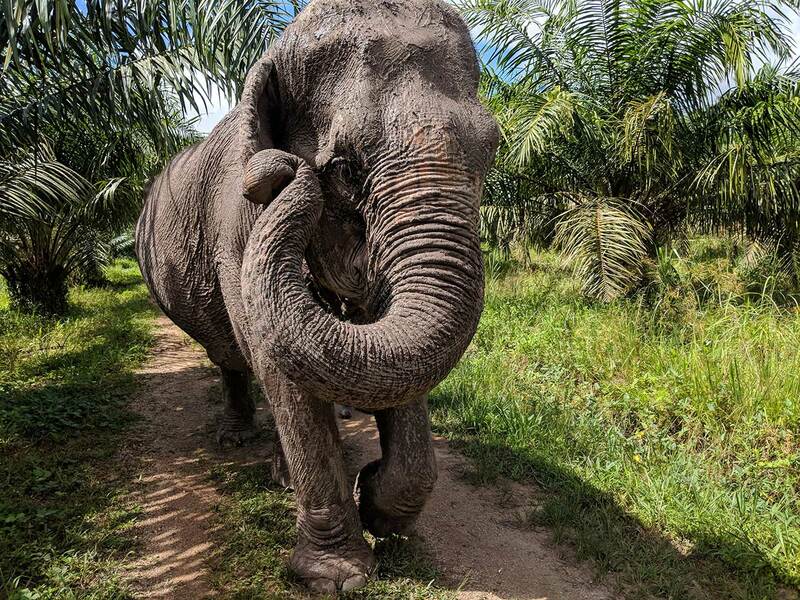 Again, approach elephant sanctuaries with caution and skepticism, because they might be hurting these animals behind closed doors but selling you a different story. 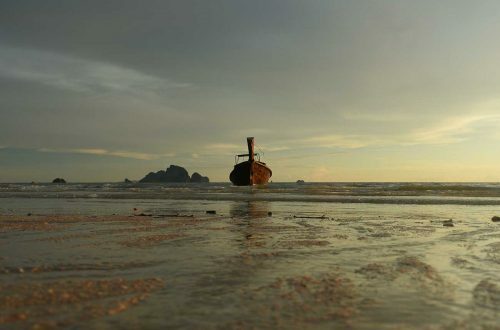 Looking for things to do in Thailand but not in the Krabi area? No worries! There are plenty of other ethical elephant sanctuaries throughout the country. We found some great reviews for sanctuaries in Chang Mai and Phuket. Of course, do your research before going and ask any questions or bring up any concerns to the sanctuary before going; if they respond and are respectful then you’re probably on the right track! Elephants are amazing creatures and we hope you get to spend some time with them while in Thailand! Comment below about your experience with elephant sanctuaries in Thailand or if you have any questions or concerns! I absolutely love elephants!! I’m so glad you did so much research and found a good sanctuary. I tried to find one near bangkok last time we were there, but there was nothing! It’s hard to find a good one because a lot of places use the word “sanctuary” as a marketing tactic. Hopefully you get to visit one someday! Every time we passed tour booths promoting “jungle trekking” on elephants it made us sad. 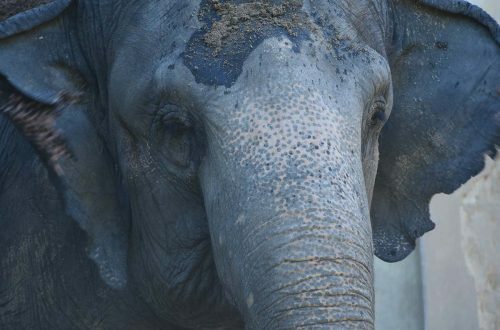 It’s unfortunate that people are misinformed about how bad riding can be for the elephants. Thanks for reading! 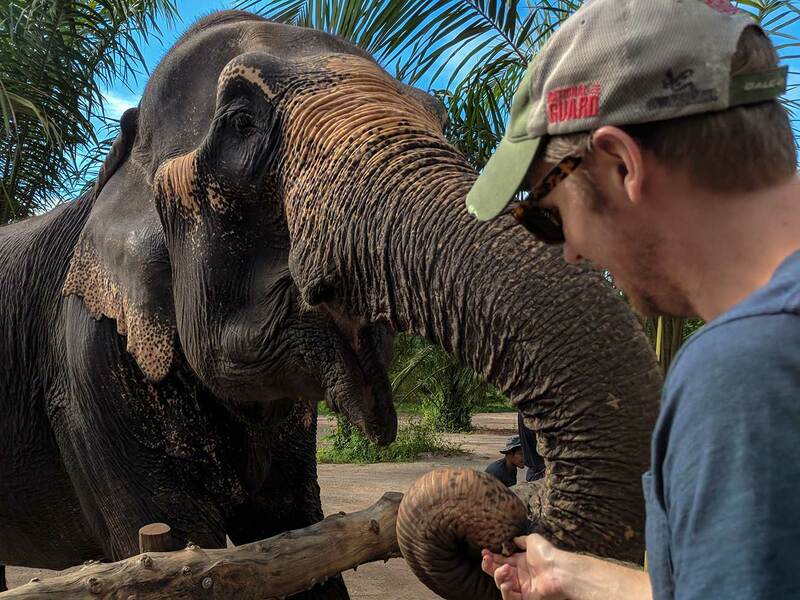 I visited an elephant sanctuary in Thailand and it was an amazing experience! I actually saw there was one in Krabi but ended up not going to that one. Which one did you end up visiting in Thailand (Maybe we’ll go if we ever make it back to Thailand)? There are now two in Krabi but one of them doesn’t seem to be a real sanctuary, unfortunately.